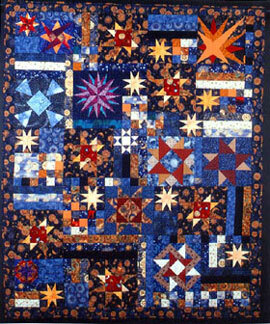 These quilts are art, therefore each quilt is an original. For custom commissioned pieces, go to the contact page. 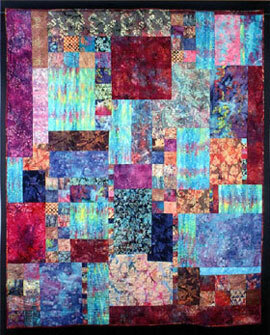 Machine pieced, machine quilted, hand beaded. 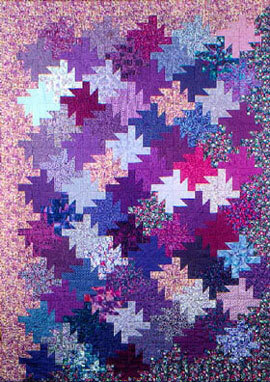 This quilt contains seventy different shades of purple fabric. The blue flowered fabric on the right and bottom border originally contained teal flowers, Kathie hand painted these flowers purple. Kathie made this quilt for her oldest son, Lucas Schwarz. He will graduate in the year 2000 and that is why there are subtle millenium references in the quilt. Kathie spent two years collecting as many different examples of the new hand dyed Bali fabrics that she could find. They are exceptional in their beauty (and not as easy to work with as normal cottons). 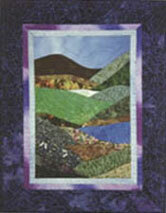 She designed this quilt to look simple in order to have the viewer focus on color and design. 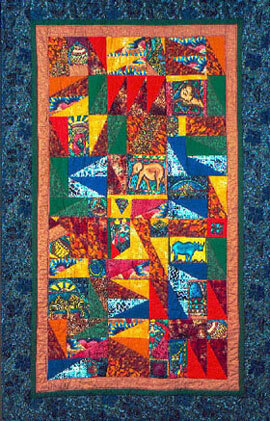 This quilt was awarded a first place ribbon in the 1996 Washington County Field Days Quilt Show in East Montpelier, Vermont. 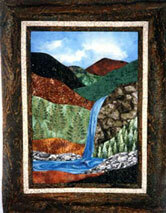 It has also been shown in the Vermont Quilt Festival in Northfield, Vermont. Curved piecing technique, applique, machine stitched and machine quilted. This quilt was a commision piece made as a gift for a wedding. 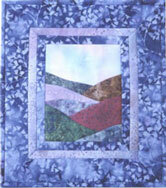 Each fabric was cut and designed as the quilt grew and developed its own individual shape design. 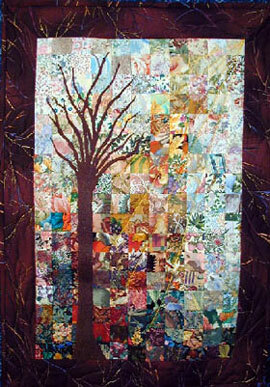 It is heavily quilted and took nealy 40 hours to complete the machine quilting. 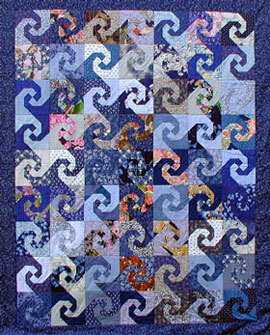 Shells, starfish, waves, anoemes and other ocean like images were stitched into the quilt. 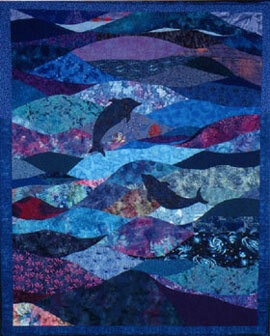 The dolphins were drawn freehand and then applique stitched onto the surface of the piece. The ocean has depth as the dolphins give rise to the surface. 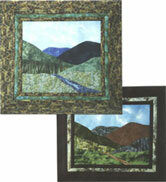 These wallhangings are examples of the types of landscapes I have for sale. The sizes are approximate and are listed under each picture along with the cost. 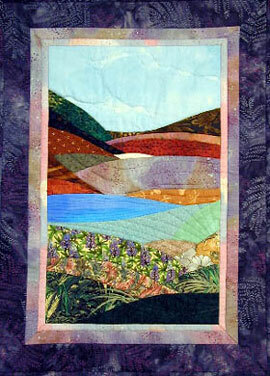 I hand paint the sky fabric in all of my landscapes. It gives them a depth and realism that can't be found in regular fabric. No two landscapes are ever exactly the same. If you like what you see, I can sell it if the piece is still available or reproduce one in similar colors. I can also let you participate in the selection of the border colors. I am available for commission work if you have a picture of a special landscape that you would like reproduced or you may want something in a specific size for a space in your home. These wallhangings can be ordered here in finished form ready for display or, if you are a quilter, you may order one of my patterns from the pattern page and make one yourself. Thanks for your interest in my work! 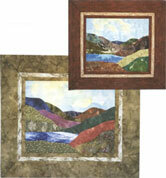 To purchase a landscape wallhanging, go to the contact page.